The Offlede: Assignment NOLA: Prejudice appears amid darkness on road, in N.O. Prejudice appears amid darkness on road, in N.O. Above is St. Vincent Guest House, the hostel where I will be staying for three nights. According to a posting in the lobby, it was built in 1861 and was once an orphanage. 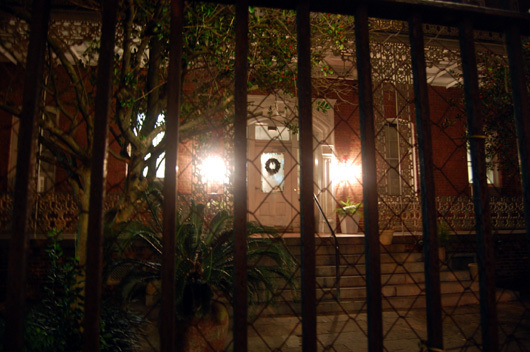 According to a brochure in the lobby that touts ghost tours of New Orleans, it's haunted. One thing is for sure: It was cheap, as many hotels in New Orleans also are, out of desperation to attract tourists. It's in the Garden District, a non-tourist neighborhood that fared better than most in Hurricane Katrina. 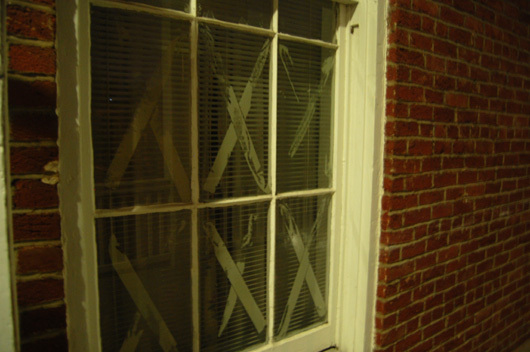 Below, however, you can see that the window to my room still bears some scars, or at least, the remnants of duct tape. Ten hours, four minutes and 699.4 miles after leaving Melbourne, I'm here. I stopped three times: twice to get gas, once to release it. The trip went smoothly, more than I could have imagined. Just as everything went wrong during Hurricane Katrina, I expected Murphy's Law to kick in for my road trip. After all, it usually does. On my last journey, I almost punctured my oil pan when I ran my car over a curb in Washington, D.C., then my 2000 Chevrolet Prizm got nailed with a chunk of rubber from a tractor-trailer tire somewhere in northern Georgia. But not this time. I ruled the road. Today, I got my first taste of the real South. Well, just a morsel, actually. I once visited Savannah, Ga., but never ventured beyond the tourist-swarmed historic district. Paula Deen buttered up my belly when I visited her restaurant in Savannah. My cousin, a very good cook himself, once said, "She puts butter where it doesn't belong." But it felt nice in my belly. Paula Deen's restaurant is hardly the real South, though. Today, I drove over Interstate 10 through Florida's Panhandle. It's a route lined with stately pine trees and large expanses of brown grass and cylindrical bails of hay. I could tell it hadn't rained much recently. Four times I encountered smoke. There must have been fires. But I didn't mind the smell. I was just happy to see hills and a tree variety other than palm. I've grown tired of Central and South Florida's flatness and rather boring palm trees. I could tell I was in the South when I saw a scraggly, deeply tanned old man sitting on a five-gallon bucket by the side of an on-ramp, clutching a guitar with one hand, trying to thumb a ride with the other. I could tell I was in the South when I saw an outboard motor on the side of the highway. During my time on the road, I've seen many things strewn in the median. That was a first. It must have jiggled off someone's boat. I think it was an Evinrude. Wait a minute. Am I being prejudiced? I really could tell I was in the South when I stopped at a gas station just south of tiny Grand Ridge, Fla. - an Exxon, I think it was, quite run-down. In the restroom, scribbled on a sign that said "Hold down on handle until toilet flushes," were some rather racist remarks, and it didn't appear that any of the gas station employees had bothered to cover it up. I won't quote it verbatim, but to paraphrase, it said something like: The problem with America is black people. Race was a large issue during Katrina. Some argue that the Federal Emergency Management Agency was slow to react because the ones who needed rescuing were black and poor. I doubt that. There was a racial issue in place long before the storm that contributed to blacks' plight during it. Many of the poor black people were pigeonholed, segregated and ghettoized into the most flood-prone part of New Orleans, the Lower Ninth Ward. Barack Obama, whose audio book "The Audacity of Hope" I listened to during the trip, suggested that the government create employment programs so that, if a Katrina-like storm ever struck again, maybe the once-poor people would have the means to make it out of the city. Much of his book was idyllic, but at the same time, he criticizes idyllic goals for government. Obama derides ideology (especially the ideology of the current president) because it doesn't take facts into account. But he later writes that the failure to react promptly to Katrina was the result of bureaucrats viewing the "world as it is, rather than the world as it should be." What can be more idyllic than that statement? The "world as it is," facts included, should be the determinant of government policy. I myself can't prescribe any answer for the putrid response to the storm. Obama says that "America was unable to control its own destiny." Maybe that was, indeed, exactly the case. Maybe there was nothing that could have been done. I came from a poor family, according to government definitions. But I never felt that I was poor. Why? Because I had a loving family that lived (comfortably, mind you) within its means. Maybe the problem isn't government. Maybe it's at home. Experiencing New Orleans will be a race-education endeavor. Down East Maine, where I grew up, is more than 90 percent white. And the largest minority is American Indian. As a result, I sometimes think I have my own prejudices. As a lighthearted example, I'll tell you about something I saw on the highway somewhere in Alabama, an area where the number of Texas license plates was building rapidly. I drove up behind a white Chevrolet Malibu with Texas tags. I peered through the rear window at the driver and passenger. I could only see their silhouettes, with the setting sun in front of them, eliminating all detail. It appeared as though, on their heads, they wore circular objects with a tube rising from the middle. They looked like cowboy hats. But as I passed the car, I noticed that my eyes had duped me: They were visors, which had been pulled down to block the sun. Cowboy hats? Not even close. Of course, the only reason I thought they were cowboy hats was because of the Texas license plate. If the tag was New York or Pennsylvania, I would have thought they were just visors. The point is: Eyes deceive us. What we see or think we see is not always the truth. We were exposed to many horrific images during Katrina - of grief, of violence, of victory over Mother Nature. The moral of the story: Don't judge before you find the truth on your own. I'm in New Orleans to see what this city is really like. I'm here to judge through my own eyes, not through sensational media images, not through winding political rhetoric. As I drove into New Orleans this evening, though it was dark, I could see that rest stops were gated off, buildings were boarded up. Will the first impression be a lasting one? Interesting little blog you've started, Kinappie. How did you like the middle of Fla la land? It sounds like you're using the basic meaning of prejudice: to judge something before you know anything about it or to have a preconceived notion of it. Hm. I look forward to reading more posts. Do you think there's a more accurate word for the concept I'm referring to? I thought about it, too, but I'm pretty happy with my choice. Since I wrote this, I've been thinking about it more. And it's this: In the South, prejudice has a limited definition, black and white. It sounds like your definition is much greater than that, including North and South, old and new, redneck and city, as well as black and white. Yeah. I'd call that racism.